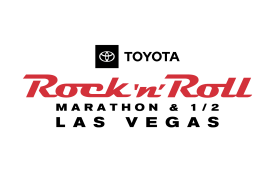 LAS VEGAS (Nov. 8, 2018) – The 2018 Toyota Rock ‘n’ Roll Las Vegas Marathon & ½ Marathon gives runners the once in a lifetime opportunity to run on closed lanes of the famed Las Vegas Boulevard. The world’s largest nighttime running event, which will host approximately 40,000 runners this year, returns this weekend, November 10-11. Runners of all levels will light up the Las Vegas Strip at night as the only private event to exclusively shut down the famed boulevard. The course gives runners a one of a kind nighttime running experience past iconic Las Vegas sights such as the ‘Welcome to Las Vegas’ sign, the Bellagio Fountains, Fremont St. and downtown Las Vegas before finishing in front of the Mirage Hotel & Casino. This year, for the first time ever, fans around the world will be able to tune-in to the Rock ‘n’ Roll Marathon Series Facebook page for a 4-hour live broadcast of the race beginning at 4:15 p.m. PT on Sunday. Race weekend kicks off with a Health & Fitness Expo today, Thursday, Nov. 8 and will run from 3:00 p.m. – 6:00 p.m., continuing on Friday, Nov. 9 from 11:00 a.m. – 7:00 p.m. and Saturday, Nov. 10 from 9:00 a.m. – 6:00 p.m. at the Las Vegas Convention Center. The expo will showcase vendors featuring the latest in running gear, nutrition and training and is free and open to the public. The running will start on Saturday night at 6 p.m. with the Rock ‘n’ Roll Las Vegas 5K presented by Brooks followed by the marathon, half marathon and 10K distances on Sunday evening. After the 5K, runners will enjoy musical group, Ozomatli, at the finish line stage for the Toyota Rock ‘n’ Roll Marathon Concert Series. Runners can choose to participate in the “Remix Challenge” and earn a bonus third medal by running in both the 5K on Saturday and any distance on Sunday. Race organizers previously announced a new start line for the course at the heart of Las Vegas Blvd. between Harmon Ave. and Park Ave. In addition, the Toyota Rock ‘n’ Roll Concert Series featuring headlining act, Capital Cities, will be held Sunday before the marathon and half marathon at the start-line festival. The concert is free and open for all runners, family, friends and the local community. In addition to the headliner concert, live bands and DJs of every genre will play along the race courses entertaining and encouraging runners as they make their way to the finish line.